ROLLICK!, is a hit party game that's a fast and furious team charades competition. It's a hysterical, fun, fast-paced game that's an absolute riot at parties, family gatherings, work events, holiday celebrations, with friends, and is even loved by teenagers! It's perfect for family fun night, parties with friends or as a team building activity. 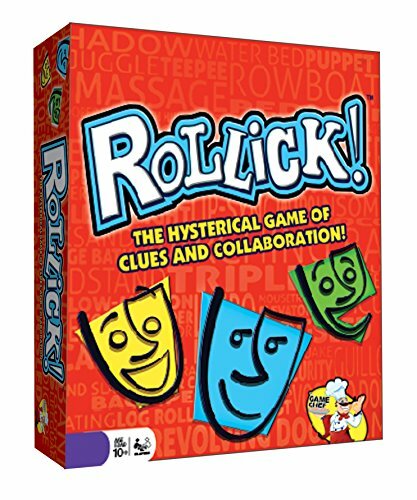 With ROLLICK!, the entire team collaborates together to act out clues for one or more person(s) to guess. Teams have 60 seconds to attempt to guess as many clues or phrases as possible. The team with the most points at the end of the game wins! With over 750 clues, including words for younger children, suggestions for large and small groups, and other fun variations, no game is ever the same! For hours of hysterical fun - the choice is ROLLICK! What People are Saying: "Still can't stop laughing." "No doubt this will become a classic" "Family LOVED this game!" "My teenagers ask to play with us." "It's CHARADES on steroids!" PARTY GAME - An award-winning party game that's a fast and furious team charades competition. CHARADES - Team charades played backwards or in reverse! Charades is more fun when everyone gets into the action. Kids, teens, college students, adults and families love it! CREATES LASTING MEMORIES - Requires teams to collaborate together without saying a word. The improv moments create lasting memories that will be talked about long after the game has ended. ADD TO YOUR CART NOW! It will be a hit at your next party or family game night.